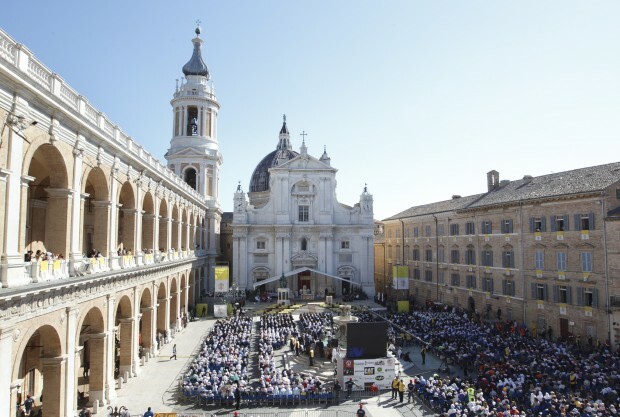 LORETO, Italy (CNS) — During a visit to the Shrine of Our Lady of Loreto, Pope Benedict XVI formally entrusted to Mary the world Synod of Bishops and the Year of Faith. The pope was marking the 50th anniversary of Blessed John XXIII’s visit to the Marian shrine, about 175 miles northwest of Rome, when he entrusted to Mary’s care the Second Vatican Council, which began Oct. 11, 1962. “Fifty years on, having been called by divine providence to succeed that unforgettable pope to the See of Peter, I, too, have come on pilgrimage to entrust to the Mother of God two important ecclesial initiatives: the Year of Faith,” which was to begin Oct. 11 and the Synod of Bishops, which was to open Oct. 7. About 10,000 people gathered in the square outside the Loreto shrine for the pope’s morning Mass. Most of the pilgrims stood in the shadow of the shrine, protected from the sun shining in a clear blue sky. At the end of his homily, Pope Benedict turned to Our Lady of Loreto with several petitions. “I wish to entrust to the Most Holy Mother of God all the difficulties affecting our world as it seeks serenity and peace,” the pope said. He prayed for Mary’s intercession in responding to the “problems of the many families who look anxiously to the future” and for young people just starting to build their adult lives. With the famous conical statue of Our Lady of Loreto near the altar, Pope Benedict’s homily focused on Mary as the best possible example of following God’s will and bringing Christ to the world. “She placed her entire being at the disposal of God’s will, becoming the ‘place’ of his presence, a ‘place’ of dwelling for the Son of God,” the pope said. When Blessed John visited Loreto 50 years ago, the pope said, he told people that the aim of the Second Vatican Council was to spread throughout the world the benefits and blessings of God having become human, suffering and dying to redeem humanity. United in faith, he said, all men and women become brothers and sisters, caring for and supporting one another. Often today, he said, people think making a faith commitment means giving up their freedom, when in reality God liberates people from the selfishness and thirst for power that can consume them and harm others. Pope Benedict traveled to and from Loreto by helicopter. After the Mass, he remained for lunch and a rest before a scheduled 5 p.m. return to the Vatican.